Support the Arts in San Diego - Don't Let The City Council Make Cuts to Art Programs! Join us and let the city council know that you support the arts in San Diego. Please attend this meeting and tell Councilmember DeMaio not to make these cuts to art programs. Let him know that San Diegans support the arts and artists! Councilmember DeMaio is holding a series of public Budget Town Halls to brief San Diegans on the Road to Recovery plan, answer questions and listen to their ideas. A Town Hall is scheduled for Tuesday, December 14 from 6pm to 8pm at the NTC Command Center, 2640 Historic Decatur Road. The Command Center is in the heart of the city’s planned 26-building Civic, Arts and Cultural District at the former Naval Training Center. Already 7 buildings are renovated and are home to over 40 Civic, Arts and Cultural organizations and artists - many of which will be impacted by the Councilmember’s proposed cuts. Representatives from arts and cultural organizations are encouraged to attend the Forum and can RSVP at Roadmap to Recovery Facebook Page and click the "I'm Attending" button in the upper right corner. In advance of the Town Hall, on Thursday, December 9 at 10 AM, These Days on KPBS will air a segment about this discussion. Dalouge Smith, CEO of San Diego Youth Symphony and outgoing Chair of San Diego Regional Arts & Culture Coalition, and Seema Sueko, Artistic Director of Mo`olelo Performing Arts Company, will be on air. Please tune in (89.5 FM or www.kpbs.org ), and feel free to call in to join the conversation. Another Holiday Hit List is History - We'll See You Next Year! Yes, it's sad, but the 4th Annual Holiday Hit List has come and gone. I hope that everyone had a great time that day. 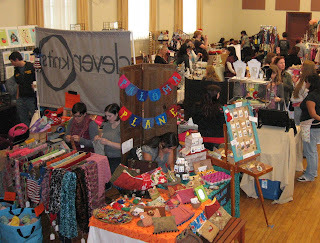 I really enjoy talking with all the vendors and checking out everyone's wares. If you missed this year's event, you can read about it online and shop online from most of our vendors. Check out the two articles and visit our vendor line up page! The San Diego UT covered our 4th Annual Holiday Hit List with two articles! "Christmas Gifts With an Edge Found at North Park Crafts Fair"
Shop from the vendors who participated at this year's Holiday Hit List! 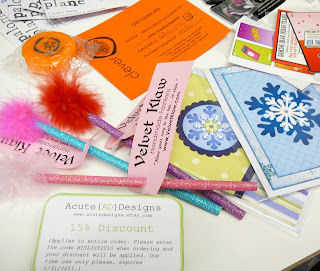 Visit the Craft Mafia blog! Holiday Hit List Happens Tomorrow! Join me tomorrow for the 4th Annual Holiday Hit List at the Masonic Hall in North Park! Get your holiday shopping done and buy from local artists & crafters. There will also be a polymer clay demo where you can try your hand at this fun craft! Door open at noon, but don't be late if you want to snag a swag bag! See you there! Part of getting ready for the big Holiday Hit List show is the swag bag compilation! I always look forward to seeing all the great things that we get from our vendors, and it's a fun evening for all the Mafia members as we put them together. Really, it is! Take a peek at this year's swag. There's only 100 bags to give out (1 per family), so don't be late for this year's Hit List! For more info about all this, and the Holiday Hit List, visit the North Park Craft Mafia blog!